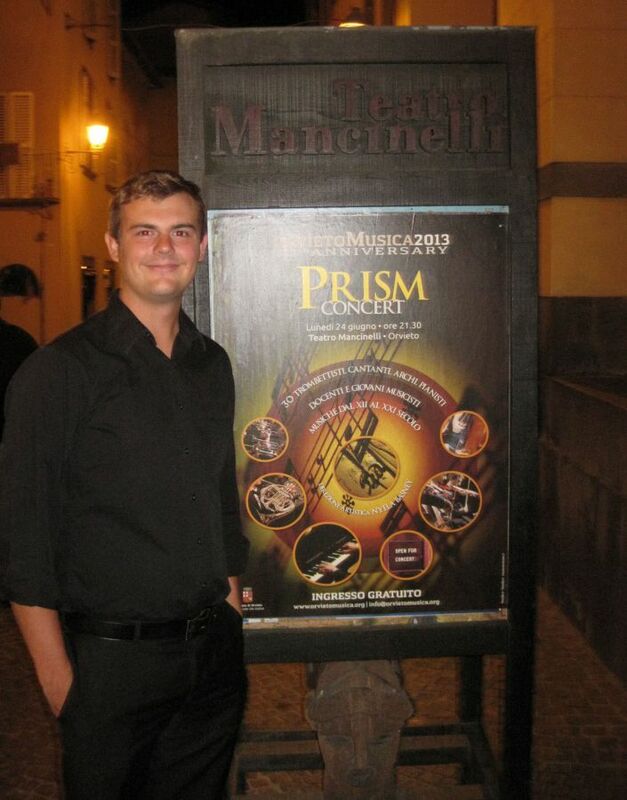 Philip Carter and his Illinois State classmates practiced and performed in Italy last summer. 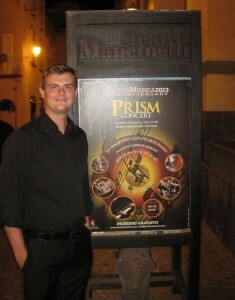 A Friends of the Arts grant supported senior Philip Carter’s trip to the Orvieto Musica TrumpetFest last June in Italy. In October Carter and the Illinois State Trumpet Ensemble held a public event at the University where they performed music from the trip and shared their experiences. Carter, a music education major and jazz performance minor from Collinsville, recently talked about why he came to Illinois State, the music festival, and the importance of Friends of the Arts grants. I did multiple campus visits when looking at schools. I came to ISU three times and each time I would get a lesson with a trumpet professor here and sit in with one of the bands. It really just came down to the relationship I had with the faculty. When I came here, it just felt right. The faculty here I feel is outstanding. It was the main drawing point for me and continues to be a reason of why I am so pleased with my choice to come here. Tell me about the trip last year. The festival is called Orvieto Musica and within that festival is something called TrumpetFest. TrumpetFest is run by our trumpet professor on campus (Amy Gilreath). TrumpetFest in itself draws from about 30 trumpet players from throughout the (United States). They came from four different universities. Throughout the weeklong festival, we had rehearsals every morning for trumpet ensemble. We gave about three performances. We performed in one of the churches within Orvieto, one of Orvieto’s piazzas, and also in the city’s theater. On top of that we also had opportunities to have master classes with the professors from the different participating universities that were there. On top of performing, we had survival Italian language courses and were very much submerged in their culture. How did the crowds respond? Before going, our trumpet professor said that the community would come out and support us. But it was really great to get over there and actually see it. No matter what kind of music we were playing—whether it was Italian composers like Verdi or if we were playing music of American composers—they were really excited about music. It was cool to see them appreciate our culture and we also appreciate theirs, and that it was all drawn together through music. For me, this was something I really wouldn’t have been able to do unless I had help funding it. Trips abroad are obviously expensive. Also my curriculum is so sequential that if I were to go and study abroad during the semester, it would add time to my plan of study and then become even more expensive. When I came upon this opportunity, it was something I knew I wanted to pursue but I knew it would cost a lot. Friends of the Arts really helped make this happen for me. I will be heading to student-teach at O’Fallon Township High School come the fall, and I will graduate in fall of 2014. What do you want to go into? My end goal is to become a high school band director so that I may share my passion of music with others.